I slept in til almost 7am this morning! Liz and I could not pull ourselves from the comfy bed Sarah provided for us. I could have laid there all day! We had an entertaining morning with the four kids running around after a special breakfast of Frosted Flakes. My favorite cereal! Sarah took us (and the kids!) to the grocery store, PO, and gear shop. This is my first fully resupply because I usually have all my food sent to me. Since I changed plans this week, I gave half my resupply to Liz at Burney Falls and now need to get food here. A pain, but it’s nice to buy what I’m in the mood for on this leg. Sarah and the kids were amazing and she got us back to the trailhead by 11:30am. Again, Sarah’s generosity made our Shasta stop awesome! Thank you Sarah and family! 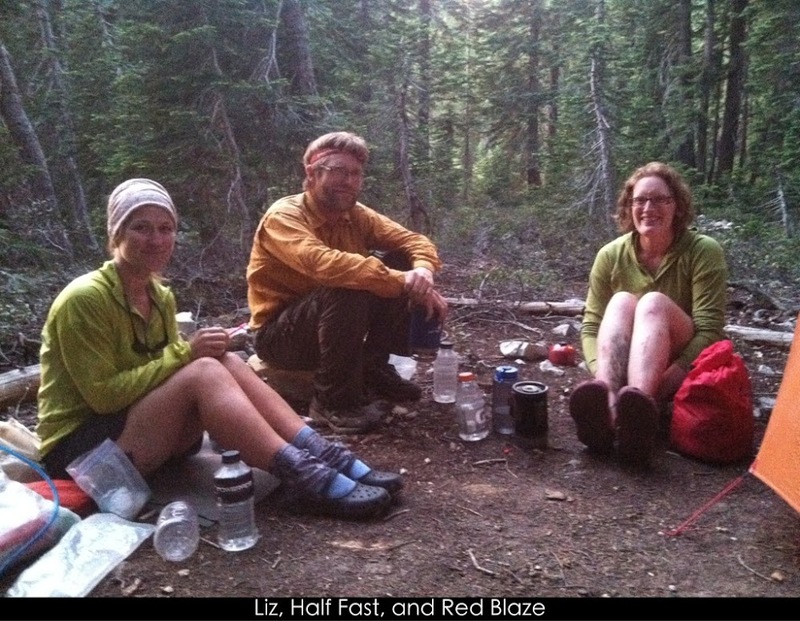 I was ready to get some miles in, but Liz still needed to organize her pack and get all her food packed for this leg. I’m working on being less “wired” and tried to lay there patiently without worrying about the increasing heat and mileage ahead. About 30mins later, a car drove up to drop off hikers who were heading southbound. 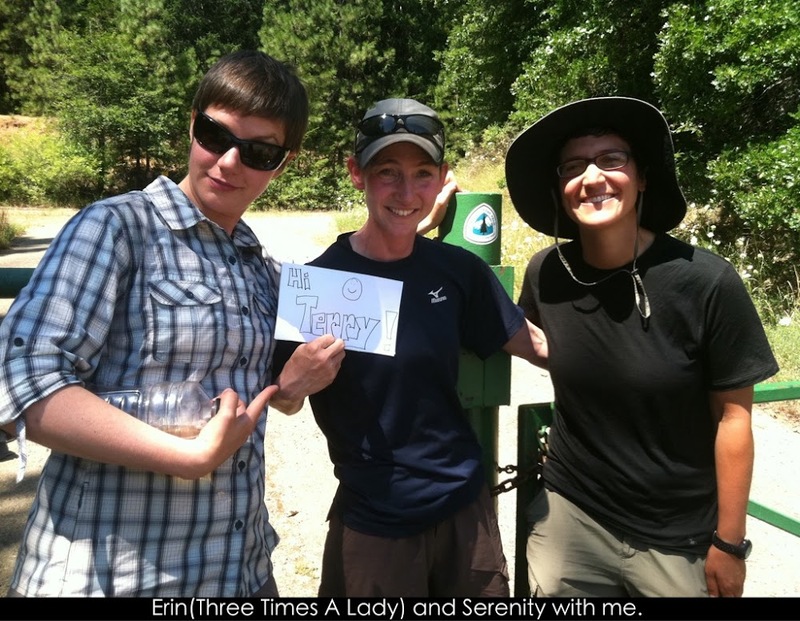 It was Serenity and Erin(now Three Times a Lady)! Yay! I met them the first week and I think I even mentioned in my journal that they gave me food on day five or around there. Anyway, they jumped up because of the snow and been going southbound. Erin’s mom has been commenting on the journal and let me know to look for them. We actually almost missed each other and a chain of events on both sides made this chance meeting occur. So great how this trail works out! It was great to see them and a bummer they weren’t headed north so we could hike together. We talked for a good half hour before parting ways. We had to get this picture with a shout out to Erin’s mom. Hi Terry! By the time we started hiking, it was 12:30pm and we had a long hot hike ahead up Castle Craggs. We hiked a couple hours and took a late lunch break that we said would be shorter than regular days so we could stay on task. Of course, that didn’t happen. 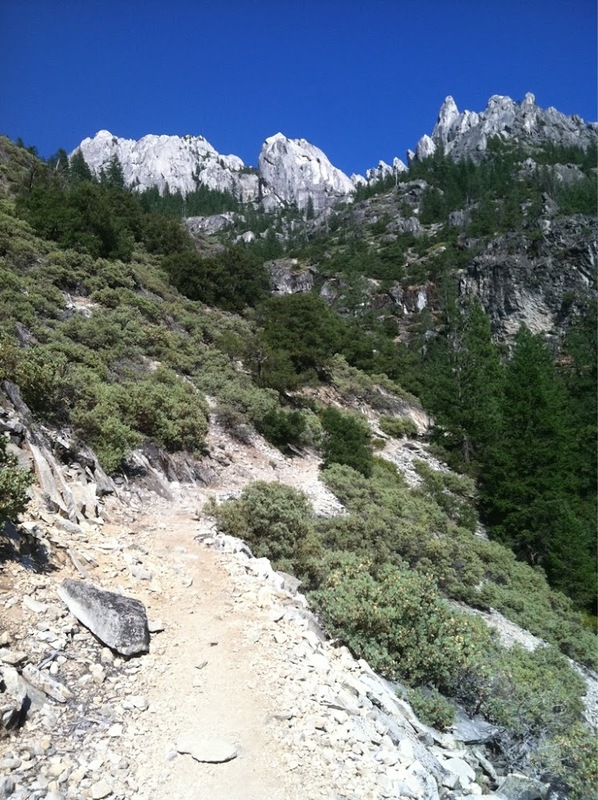 Right as we were finishing, up walked fellow hikers Red Blaze and Half Fast. I’ve known them since the first week, but we have never hiked together. They have mostly been a couple days ahead of me. They zeroed in Shasta and now we’re all on the same track to Etna. As a funny side note, after I stopped hiking with Pine, Blister, and Top Shelf, they joined with them for a bit. They mentioned that the guys were called team Bad Call after our Bear Creek incident in which they left me solo in the Sierras for 24hrs. I had heard of that name and thought that’s just what others were calling them, but it turns out that they were actually calling themselves that. I found it amusing. Right now, Top Shelf should be about three days ahead of us and Blister is about 5 days ahead. I’ve been in contact with them and they are doing well. Back to today. The hiking was hot, uphill, and tiring. We were dripping sweat and trying to take in plenty of water. The views of Castle Craggs were nice though. You can see a nice cloud rolled in the last couple hours of the day and shielded us from the sun. 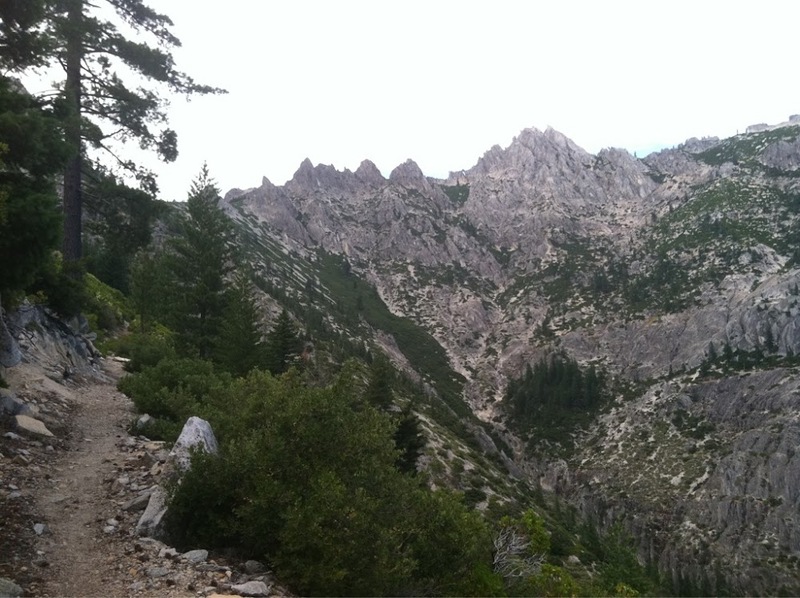 With the rocky area and steep terrain, there were few options for camping. We settled on a spot earlier than I would have liked, but there just isn’t camping ahead. It was a good start to the leg and I’m glad we got a lot of the uphill out of the way. Also, recently on the PCT-L, Meridith, a trail angel who gives rides to hikers going into Chester after the halfway mark, posted pics of those of us she helped. It’s fun to see many of those I’ve hiked with and I thought I’d share it. It isn’t all inclusive, but many of those I’ve around and with are pictured. She’ll be updating it as more hikers come through.